Multi-use, multidimensional highlighting powder brings customizable light to the face, eyes and décolletage. Prismatic pigments deliver longwearing illumination that won't fade or shift. Using different brushes, you can sweep on the level of illumination you want, where you want it. Modern, compact powder has a soft, creamy texture that applies smoothly and evenly and won't ever flake or crumble. 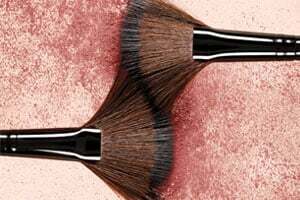 For a soft, natural application, use the Fan Powder Brush and sweep lightly over skin—anywhere you want a subtle glow. For more intense illumination, use a brush with dense bristles like the Crème Cheek Colour Brush. This will allow you to pick up more product. Apply/strobe in targeted areas where you want to see the glow and blend. INFATUATION, TEMPTATION, DEVOTION: MICA, CETEARYL ETHYLHEXANOATE, HDI/TRIMETHYLOL HEXYLLACTONE CROSSPOLYMER, SQUALANE, OCTYLDODECYL STEAROYL STEARATE, GLYCERIN, POLYSORBATE 20, CAPRYLYL GLYCOL, ETHYLHEXYLGLYCERIN, 1,2-HEXANEDIOL, CHONDRUS CRISPUS (CARRAGEENAN), XANTHAN GUM, PENTAERYTHRITYL TETRA-DI-T-BUTYL HYDROXYHYDROCINNAMATE, TIN OXIDE, SILICA, DICALCIUM PHOSPHATE, SYNTHETIC FLUORPHLOGOPITE. MAY CONTAIN/PEUT CONTENIR/(+/-): CI 77891 (TITANIUM DIOXIDE), CI 77491, CI 77492, CI 77499 (IRON OXIDES), CI 77742 (MANGANESE VIOLET). INDISCRETION: MICA, CETEARYL ETHYLHEXANOATE, HDI/TRIMETHYLOL HEXYLLACTONE CROSSPOLYMER, GLYCERIN, SQUALANE, OCTYLDODECYL STEAROYL STEARATE, POLYSORBATE 80, CAPRYLYL GLYCOL, ETHYLHEXYLGLYCERIN, 1,2-HEXANEDIOL, CHONDRUS CRISPUS (CARRAGEENAN), XANTHAN GUM, PENTAERYTHRITYL TETRA-DI-TBUTYL HYDROXYHYDROCINNAMATE, SILICA, DICALCIUM PHOSPHATE, SYNTHETIC FLUORPHLOGOPITE. MAY CONTAIN/PEUT CONTENIR/(+/-): CI 77891 (TITANIUM DIOXIDE), CI 77491, CI 77492 (IRON OXIDES).